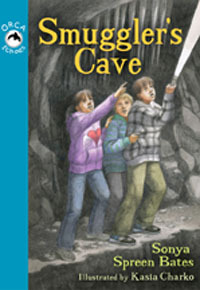 Smuggler's Cove is an illustrated early chapter book about Jake, his little brother Tommy and cousin Lexie. Jake and Lexie are fierce competitors with Tommy tagging along. Lexie challenges Jake to a boat race out to Smuggler's Cave. The three become trapped by the rising tide. Can they escape? Sonya Spreen Bates has the wonderful knack of immediately establishing character relationships. Although Smuggler's Cave is a sequel I had not read the first book and I never felt I was any missing information. Told through Jake's perspective we are able to hear his motivations and thoughts and while the rivalry between Jake and Lexie is what lands the trio in difficulties, they are able to work together to find a way out. The plot moves quickly with plenty of twists and turns. The style of language used is perfect for early readers but the book never plods and nor are young readers written down to. Every word builds adds to the setting, characterisation or plot and moves the story along. The dialogue is realistic and snappy contributing to the fast pace of the story. There are 15 of Kasia Charko's black-and-white page-sized illustrations throughout the book, highlighting the drama of the story and breaking up the text. The publisher Orca Books is offering a sneak peek at chapters of Smuggler's Cave and Sonya Spreen Bates is currently their featured author.